This Saturday, on January 20th, I’ll be taking part in my third Swim for the Reef to raise money for the Environmental Defenders Office so they can protect the Great Barrier Reef. I’m with the Avid Readers and Writers for the Reef team, swimming with luminaries such as the amazing bookstore owner Fiona Stager and writer Anita Heiss. The day is at Musgrave Park Pool and it’s a wonderful community event. It also includes an inflatables race! Today I met my training goal of swimming three kilometres, aided in no small part by Haruki Murakami’s What I Talk About When I Talk About Running, his memoir on running and writing. A fellow runner gave Murakami the mantra ‘Pain is inevitable. Suffering is optional.’ Thus getting through long distances, whether over the earth or in the water, is about a frame of mind rather than what’s happening to your body. The first fifteen hundred metres of a swim are always fine, but after that it starts getting hard. I find the best trick for getting through another fifteen hundred metres is to distract myself by thinking about my work, or a piece of writing, or by imagining myself in the sea surrounded by sharks (I am, I tell myself, learning transferable skills). Today there was ample enough diversion in trying to breathe and stay afloat while a swim squad chopped up the water in the lane beside me. As I’ve written in earlier posts, I love swimming. I grew up in a place where the heat stretched into the 40s in summer so I was always in the pool (and I have 50 billion freckles to show for it). Those waterborne hours inspired a short story that was published eighteen months ago in Griffith Review. Just as running and writing go together for Murakami, swimming and writing go together for me. If I have a problem with a piece of writing, I take it into the pool, and by the time I’ve finished my laps I’ve usually solved it. Today I tried to work out the first turning point for a novella, but was stymied by the buffeting of said squad. Still, my characters revealed a little more of themselves, which was helpful. And the water, if it’s sunny, is so glorious it’s poetry. The sunlight creates shifting patterns on the floor of the pool, bubbles peel away from my hands like mercury, and I wish I had gills so I never had to lift my head up for air. The floor of the pool is slightly less poetic: there are bandaids or squares of Elastoplast, hairpins, strands of hair and, once, a two dollar coin that I dived down to collect. All this enjoyment (and pain) aside, the reason why I’m swimming is to keep the likes of Adani from building their terrible coal mine, which will pump more CO2 into the atmosphere. The oceans have absorbed about half of the world’s man-made carbon dioxide, which has slowed global warming. However, when carbon dioxide dissolves in the ocean, carbonic acid is formed, leading to higher acidity in the water. Increasing acidification of the oceans will cause coral to become brittle in a form of what Iain McCalman calls ‘coralline osteoporosis’ (The Reef: A Passionate History, p. 331), which will be a disaster given the increase in wild weather caused by climate change. Eventually coral will become soluble in seawater, dissolving like Disprin. And of course bleaching will continue to happen more regularly with rising temperatures. Last year's team of stellar swimmers. A story on which I’ve been working since 1999, ‘Unfurling’, has been published in Our Sporting Life, an edition of Griffith Review about sport. Needless to say, I’m excited! I wrote the first incarnation of the story when I was on exchange at The University of California, Berkeley. When I workshopped it in my prose class, my teacher Clark Blaise described it as a representation of ‘unadulterated adolescent lust’. Then, it was a story about a podgy girl named Eva who falls for a boy, decides she needs to lose weight to get his attention, becomes obsessed with running and runs until she becomes ill. She doesn’t get the boy. Luckily, it wasn’t published. But Eva always loved swimming, because in the pool she couldn’t feel her body. A few years ago, I trimmed the story, emphasised her love of swimming and showed it to my short story group. There was a disconnection, I was told, between the girl’s body and mind. I looked at the story again. My writing group was right. What kind of girl didn’t want to feel her body? I got distracted by the usual mania of my life and left if for another year or two. When I took it out again, I realised it was a hopeless story for a woman to write. Girl changes her body to please boy? Ugh. What I liked about it – and what I like about women athletes in general – is the sense of power and capability that comes from having a strong, healthy body. I changed the story again to illuminate this. All of a sudden, it pinged and it was published. I’m no athlete, although I ran plenty when I was an adolescent. Every afternoon, when I came home from high school, I’d swap my school shoes for running shoes and head out into the paddocks. On the weekends I’d head into the bush in the hills. Running was a respite from the stress and isolation of school. It made me feel like I had control over my body when everything else was out of control, as it generally is when you’re a teenager. My routine died when we moved into town, which was just as well because like the girl in the story I was dangerously thin. I tried hockey for a while, but I was hopeless at team sports because meningitis had ruined my balance and I couldn’t hear my teammates on the field, nor the instructor during lessons. I was good at swimming, though, as my mother had been when she was young. I passed my bronze medallion test, but I didn’t return to the sport until I came home from London in 2009. I was ecstatic to be in the sunshine again and swam at Stones Corner pool two or three times a week. I toned and went brown, except for two curved white lines on my back from my straps. I've found swimming to be immensely meditative. If I have a writing problem I take it into the pool, and by the time I’ve finished my laps I’ve usually solved it. I like that it’s so easy an exercise and that it’s safe. I’m not likely to drown in a town pool and I don’t have to be constantly alert, as I do when I’m running, for random nutters I can’t hear who might come up behind me and stab me with a fork. Novelists tend to have active imaginations, yes. 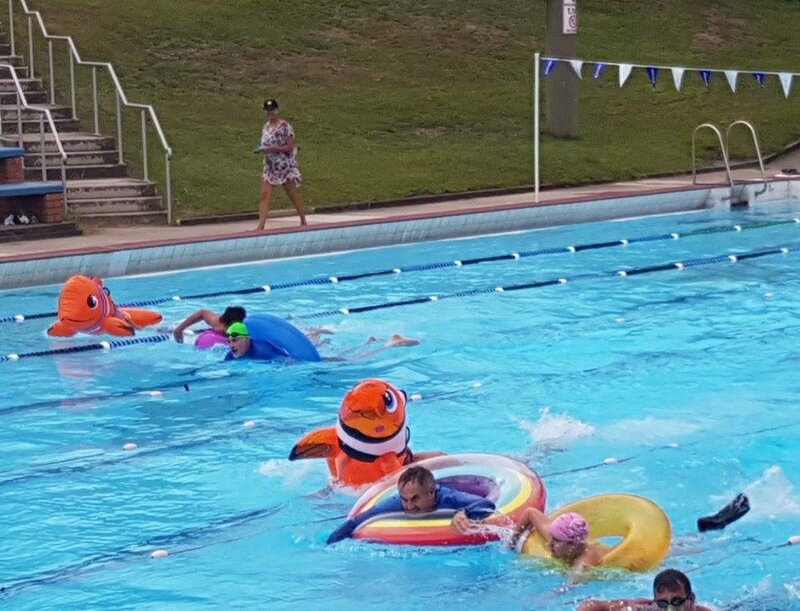 And earlier this year, I and a bunch of other literati swam laps at Musgrave Park Pool to raise money for the Great Barrier Reef, which has been one of the highlights of my year. So I was chuffed to be in an issue about sport. It made me think of English author Louise Doughty, who wrote a column in the Telegraph about the nuts and bolts of writing which turned into A Novel in One Year. People complained to her that there were already too many writers in the world, so why was she encouraging more? She replied, ‘At the age of forty, I started learning the piano. I am fully aware that I will never have a solo concert at the Barbican, but I have got hours of pleasure from plinky-ponking away in my own ham-fisted fashion … Just as importantly, I listen to piano compositions now with an immeasurably enriched understanding of the skills of those who compose and perform them’. Not everyone picks up a pen intending to get published, and I certainly don’t dive into a pool wanting to swim in the Olympics. There is a pleasure in simply doing it, and this was something I tried to convey in my story. In so intense a focus on winning, the pleasure of an activity seems to be lost. I also wanted to write against representations of sport as heavily masculinised, and to bring the pleasure of the body - that thing which had been missing - back into the story. It's not accidental, after all, that Eva experiences orgasms as she swims. On things literary and athletic, I’ll be giving a reading at the Brisbane Powerhouse on Thursday 25th August at 7pm, which will be followed by an invigorating conversation between sports tragics, writers & ex-Olympians. You can find out more about it here. And if writing is to be considered an endurance sport, well, that’s one in which we authors are clutching medals to our chests!